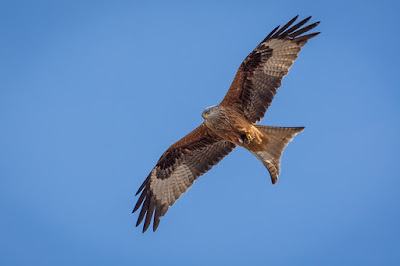 In medieval England red kites scavenged in towns for waste food and on battlefields human cadavers they were even reputed to steal clothing from washing lines to decorate their nests and steal bones from dogs. Then in the nineteenth century landowners exterminated them. The birds were thought to kill lambs ( they didn't they are scavengers) and they were easy to shoot, poison or trap. By the 1980s there was a small breeding population in a remote valley in Wales. Then the 1990s saw the start of one of Britain's most successful conservation projects. They seemed to be spaced out fairly evenly along the road and this led me to wonder if they have their own territories. Or a they are performing the role that vultures do in other places, perhaps one spots a carcass and then signals this in some way to the others who then fly in to join the feast. Since the first re-introductions twenty years ago we now have healthy breeding populations throughout Scotland, Wales and England. Red kites are even repopulating the towns and cities having been seen in N. London and Reading. Are people in the suburbs feeding them on tinned dog food I wonder. Bird watching while driving isn't a great idea, as I rolled into Fort William yesterday afternoon I was caught in a police speed trap for the momentary lapse in concentration, 3 points on my licence and £100 fine I guess.